Cat are naturally active and love to do their own thing. I’s a continual concern for owners as to how to keep their cats safe outdoors, particularly when they have unlimited access to the big wide world. Unfortunately their tendency to wander leads to around 300,000 cat deaths on UK roads every year, a staggering number considering how much we take care of them when they are at home. 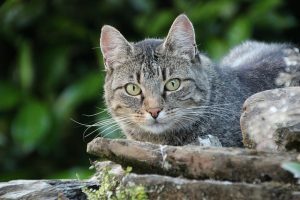 On top of the danger posed by roads, an outdoor cat also faces potential run-ins with other animals on neighbouring properties, dogs walking off the lead nearby, or bigger cats protecting their territory. A cat’s natural prey drive will also drive them to explore further afield into tempting wildlife rich areas, such as woods or local parks. Not only does this pose a problem to preserving local wildlife, but can also cause your kitty to take unnecessary risks dashing across busy roads to catch prey, or getting stuck in buildings or trees as they hunt. As a concerned cat owner, there are a couple of ways that you can keep your cat safe and sound. One solution is to set up a wire fencing system around your garden that is angled to stop your cat being able to escape. However these are generally costly, can ruin the look of your garden and be an eye-sore to your neighbours. Cats are also notorious escape artists and have been known to climb these fences to reach overhanging branches to make their getaway. The other option is to try a CatFence, an invisible barrier system that trains your cat not to stray over a safe boundary you create. Providing a stress free and safe environment for your kitty. A CatFence is revolutionary system to keep cats safe outdoors. The fence was trialed by Feline Friends a charity in Derbyshire. This unobtrusive barrier is a hidden fence consisting of a central control box that transmits a coded FM radio signal through a boundary wire that has been laid around the property. To train your cat not to stray over this set boundary, they wear a computer collar that houses a tiny FM receiver. As your cat moves towards the signal the collar emits an audible signal to indicate they should stop and turn back. If the cat continues towards the wire the collar gives a small “corrective shock” set to you cat’s individual requirements. After completing the training cats quickly learn to understand the warning beep, and will immediately turn back into the allowed zone, thus avoiding correction. As any cat owner will know, your cat is the king of its domain and will not do anything that it does not want to. This is why the CatFence system uses a form of training specifically designed for the needs of your cat. Our training accounts for each cat’s natural personality, curiosity, and movement and starts in the home, where the cat is most comfortable. When your cat is ready, we take training outside to allow your feline friend to learn where it can and cannot go. You are in control of where you set the CatFence boundary to allow your cat to wander through your garden without a care, whilst keeping them clear of any potential dangers such as poisonous plants, neighbouring properties and busy roads. When setting the boundary you can also protect areas of your property from your pet such as a fish filled pond. There is the possibility that you live on a street without feline dangers, but you have a home sized scratching post. Cats need to scratch to get rid of dead cells on their claws, as well as to help them stretch out their bodies and paws. Unfortunately for you, your cat may not always use the expensive scratching post that you bought, choosing instead your furniture, carpets or curtains. If this is the case then your cat’s collar works with the special indoor system that allows you to cordon off parts of your home keeping rooms and furniture out of bounds. It can be set on almost any surface and can stuck to door frame if you want to section off a whole room from a feline fiend. Let your cat know there is always safety at home. The CatFence containment system is the perfect way to ensure that your cat stays happy and healthy whilst still enjoying a life outdoors. If you have any concerns about how to keep your cat safe outdoors, due to busy roads or other potential threat, please call us for a quote on 01628 476475.